Sadly, I don’t yet have a recipe to share at this point. I’m cooking, and we’re eating of course… I just haven’t had the opportunity to create anything new. I’m still doing an insane amount of research as I prepare to fully incorporate menus that are gluten-free, egg-free, fish-free, soy-free, peanut-free, corn-free, and tree-nut-free. It has been a bit crazy trying to get dinner on the table! Better Batter. Yes, my favorite Gluten-Free flour blend still works for us (I almost cried in relief!) According to my communication with the wonderful people at Better Batter, only the Brownie Mix is off-limits for us. We’ve used the Pancake/Biscuit Mix as well as the Vanilla Cake and of course, the flour. I highly recommend using Better Batter flour and use it myself any time I am converting a non-Gluten-Free recipe to Gluten-Free! Applegate. My favorite lunch meat can remain our favorite lunch meat! Hot dogs, bacon, and deli meat that I don’t have to worry about the picky eater eating. (My personal favorite is still the Natural Roast Beef). On the website FAQ there is a thorough explanation of corn-free products. I truly appreciated that. And last, but not least… Flying Cauldron Butterscotch Beer. After feeling pretty horrible for telling my little man all of the things he can no longer have with his long list of allergies, it was nice to finally find a treat that he already loved was still going to be okay! After an email confirmation, I’m happy that he can have this every once in a while. Also safe are Reed’s Ginger Ale and Virgil’s Root Beer. Good to know. One big issue I have is not being able to find a mayo that is corn-free, egg-free, AND soy-free. I can find mayos that are free of 1 or 2, but not all 3 at the same time. I did find a recipe for Milk Mayonnaise. It is not true Mayo as there are no eggs, but I plan to try it anyway. More on that later! My parents had a set of Time Life Food of the World books on the bookcase in the living room when I was growing up. 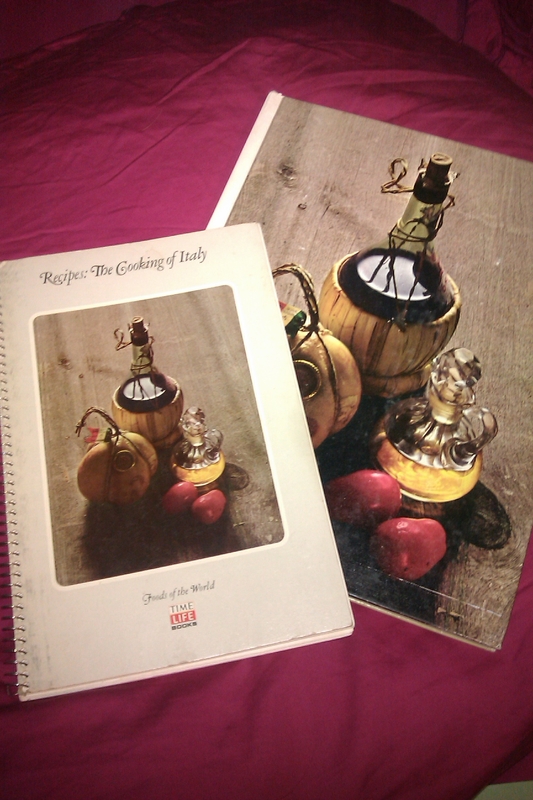 These gorgeous books featured the food of different regions and countries with a hard cover book that contained information and beautiful photos as well as a companion spiral-bound recipe book. I would read those books and look at the pictures and the recipes and dream about food. Sometimes I would dream about travelling to the places featured in the books… other times I would dream about hosting fabulous dinner parties using these regions as inspiration. These were just dreams when I was younger… first, being about 12, I wasn’t able to travel much further than the back yard… second, I didn’t cook. 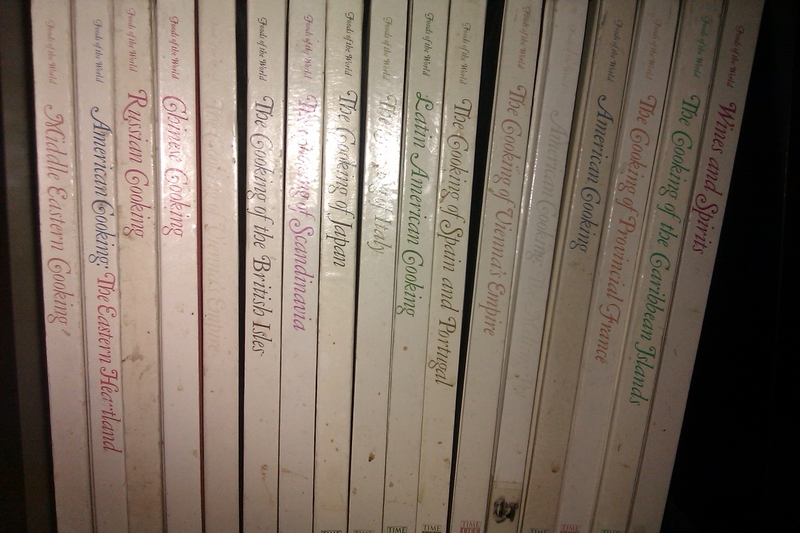 As much as those books inspired me, I still didn’t know my way around the kitchen. My mother was a good cook. Dinner was on the table every night. It was good (except for the occasional overcooked veggies). But, in my eyes… my mom disappeared into the kitchen for a while, and then, as if by magic… food appeared. It never occurred to me to go in to the kitchen and watch… or even offer to help. It wasn’t until I had a child of my own that I decided I really wanted to learn to make home-cooked meals. The kind I grew up with. While I was visiting my parents house, those books on the shelf caught my eye again. I grabbed the Cooking of Italy spiral recipe book off the shelf and decided then and there that I was making a home-cooked meal featuring a recipe from that book. Never mind that I could barely boil water. I was going to choose a recipe and teach myself to cook. And, I wasn’t going to start small… No, no, no… I chose the recipe for Cannelloni. The description: Pasta Tubes Filled with Meat and Baked in Tomato and Cream Sauce made my mouth water. I was that 12 year old girl again dreaming of trips to Italy or fabulous dinners at my own table… only now I was 25. First of all… This recipe is really four recipes. First, there is the pasta dough that is made by hand. Second, the tomato sauce made from real tomatoes instead of opening a jar or can. Third, the Besciamella, and finally, the filling. Boy, when I do something… I really do it. For someone whose whole cooking experience consisted of opening cans and boxes and heating the food in a pan or pot, I was being really ambitious. Luckily… I didn’t know any better and I set out to make the Cannelloni. It wasn’t the cheapest meal I had ever made. For one thing, I don’t think I had any of the actual ingredients to make this already in my kitchen. But I was committed to this plan of mine. I bought all the ingredients and read and re-read the directions. I made each of the four recipes (one at a time – truthfully, I had no idea that you could be working on more than one part at a time). 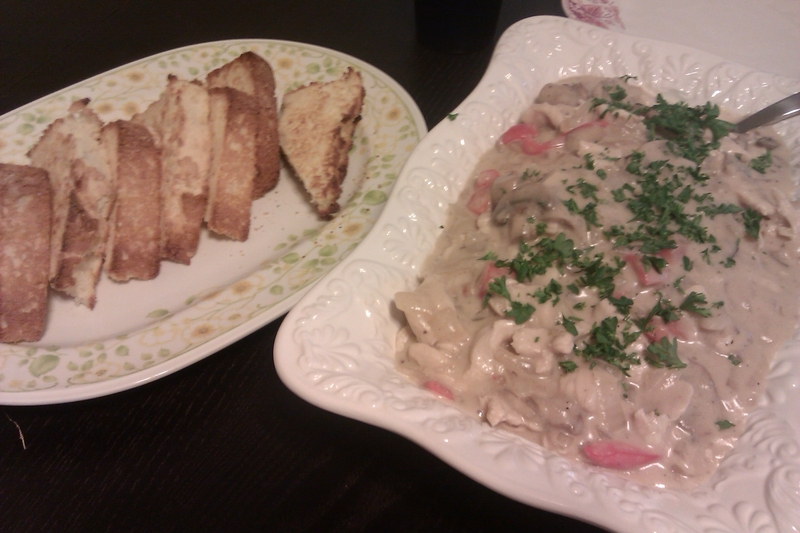 The whole recipe took me twelve hours to complete. It was a good thing I started in the late morning… and I never gave up. I just kept going. Pasta – check. Tomato sauce – check. Filling – check. Besciamella – check. I was ready to put my Cannelloni together. Twelve hours later, my poor, neglected oven finally got some use. Twenty minutes after that, I was ready to try my homemade creation. Oh my… The Cannelloni was like heaven on a plate. I think I might have cried a little (though that could be because I was exhausted by that point). The dish tasted better than anything I had eaten in a decade… and considering that everything I had eaten in that decade had come out of a box, it really shouldn’t have surprise me… yet, it did. That Cannelloni was my first attempt at cooking. And, wow! I was inspired. I taught myself a few other dishes that year… and for several years I made the Cannelloni once a year (even though it no longer took me 12 hours to cook – it was still a dish that took several hours). Fast forward another decade. When I discovered that I would feel better if I kicked gluten out of my body and my kitchen, I said goodbye to pasta and bread. Goodbye doughnuts and cakes and pies. And, for a long time, I was okay with this. My body was becoming healthy. I was finding a healthy weight (unlike a typical Celiac, when I eat gluten, I gain weight… a lot of weight… with a combination of gluten-free and low-carb dieting choices I was able to lose weight – 1/2 of my starting body weight to be exact.) And, then… I kept shrinking. People started to ask me if I was eating enough. There were whispers of anorexia or bulimia. While the early phases of Atkins had helped me slowly but consistently lose 100 pounds, I suddenly found myself losing more and more weight. I was adding in more and more carbohydrates… trying to find that perfect balance of carbohydrates, protein, and healthy fats that would keep me at a healthy weight. There just weren’t enough veggies in the world to get the carbohydrate levels right. I started looking at grains. I had already gone gluten-free at that point, so wheat, rye, and barley were out. I had no clue what to do with some of those other grains… So, I started using some of the prepared gluten-free dishes. Before long, I was eating out of cans and boxes again… doing not much more than heating food. Wait. Really? I knew better than this. I knew food could taste good. Yes. Yes, it can. And, gluten-free does not mean taste-free. It does not mean eating out of cans and boxes that have the magic “gluten-free” labeling. It does mean re-learning how to make homemade food. I had already done it once… and I was determined to do it again. I had tried to make this once using gluten-free products such as boxed pasta, jarred tomato sauce, etc… It was okay. But, it wasn’t the amazing food experience that I had before when I made this from fresh ingredients in my pre-Gluten-Free days. I figured I could make the tomato sauce, filling, and Besciamella relatively easily. It was the pasta. Last week, my son asked me if I would make him Cannelloni. I answered Yes. Yes, I will. The pasta was the only thing left to challenge me. 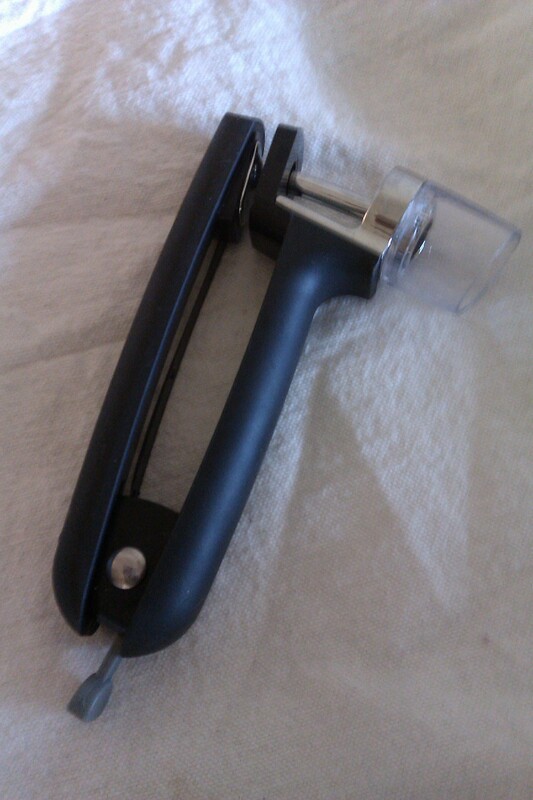 I scoured blogs reading through how others had figured taken on the Gluten-Free Fresh Pasta. And, then… I started throwing ingredients in a bowl… a kind of a compilation of what others had learned and what made sense to me, based on the base recipe for Pasta dough in the Time Life book. That night, we had Cannelloni. And, it only took me about four hours! Would you like to make this too? Here are the four recipes you need to make Cannelloni and the instructions for putting it together. After preparing the pasta dough, cut it into rectangles that are about 2 x 3 inches. Boil the pasta in salted water gently for about 5 minutes. The pasta should be tender, but not too soft. You’ll want to prepare the pasta and then set aside, covered to keep moist until the remaining components are ready. It is easier to boil the pasta before hand so it has time to cool before filling and rolling. Meat Filling – This recipe is straight from Time Life Foods of the World: The Cooking of Italy. 3/4 lb spinach – cooked, drained, squeezed and finely chopped (you can use a 10-oz package of frozen spinach – defrost, dry, and chop). Heat the olive oil in a large skillet and add the onions and garlic. Once the onions and garlic are soft, stir in the spinach until the spinach starts to dry and stick to the pan. Put the onions, garlic, and spinach in a mixing bowl. Melt 1 T butter in the skillet and add the ground beef. Once the beef no longer shows any pink, add it to the spinach mixture. Melt another 1T butter in the skillet and add the chicken livers. These are done when they are firm and light brown. They will still have some pink on the inside when you chop them. Remove from the skillet and let cool slightly before chopping and adding to the spinach and beef. 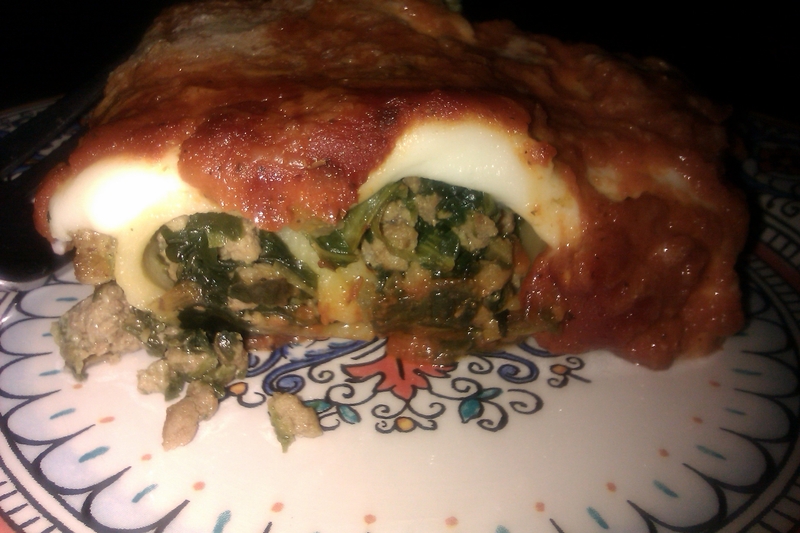 To the spinach and meat mixture, add Parmesan, cream, eggs, and oregano. Mix everything together and season with salt and pepper to taste. Set aside until you are ready to assemble the Cannelloni. NOTE: The eggs in this recipe are acting as a binder. To make this egg-free, I might try a commercial egg replacement product, but another option might be using more of the Parmesan or adding Tomato Paste or even a bit of Arrowroot Powder in place of the eggs. Besciamella – This is a delicious sauce that made me finally understand what “salt to taste” means! This recipe is from Time Life Foods of the World: Cooking of Italy. My only change to the recipe was to substitute Better Batter flour for typical flour. In a saucepan, melt the butter and then stir in the flour. Pour in the cream and milk all at once and whisk until the sauce comes to a boil. Then, reduce the heat and continue to stir for a few minutes longer. The sauce is ready when it leaves a heavy coat on the wires of the whisk. Season with salt and pepper to taste. Tomato Sauce – I do love this tomato sauce. It is so simple to make and is amazing in this Cannelloni. Jarred tomato sauce just doesn’t lend the same brightness. This recipe is also from the Time Life Series. Heat the olive oil in a saucepan and then add the onions and cook until soft. Add the remaining ingredients and then reduce the heat to allow sauce to simmer for 40 minutes to an hour. Stir occasionally. The original instructions include pressing the sauce through a sieve or food mill. I chose instead to use my hand blender to make sure any large chunks of tomato or onion were thoroughly incorporated. Taste for seasoning and then set aside until ready to assemble the cannelloni. To Assemble the Cannelloni – Easy enough once all the components are ready! Preheat the oven to 375ºF. Put a thin layer of tomato sauce on the bottom of a large baking dish. Place a spoonful of meat filling in each rectangle of pasta and roll them up into tubes. Lay each tube seam side down in a single layer in the baking dish. Pour the besciamella over the pasta tubes and then spoon the rest of the tomato sauce over that. Top with parmesan cheese and dot with butter if desired. Bake for 20 minutes or until the cheese is bubbling. If desired, broil for a minute to brown the top. Serve cannelloni directly from baking dish and Enjoy! Yes. I’ve not been a good blogger. I started off hoping to chronicle my adventures in learning how to cook for myself. Believe me, I’ve come a long way! But somewhere in the middle of THAT journey, I found myself on a variety of paths that have brought me back to learning how to cook again. This time, I am learning how to cook not only Gluten-Free, but also: Corn-Free, Egg-Free, Soy-Free, Fish-Free, Peanut-Free, and Tree-Nut-Free. Oh, and let’s not forget: free of cranberries, cucumbers, bananas, pineapple, cabbage, pears, strawberries, and sesame seeds. That’s only when it’s just the two of us – the little sous chef and me. Update: The allergist has said no restriction on eggs and fish for now. Oh… and, I’m trying to cook every meal, every day, while dealing with the pain, exhaustion, and confusion of Fibromyalgia. Because life is all about the challenges, right? So, I’m learning new things and cooking in new ways. I hope to have some recipes to share soon – especially some Asian-inspired dishes. I’ve almost figured out my son’s favorite – Orange Chicken. The little sous chef is celebrating his seventh birthday soon, so I should have an allergy-friendly birthday cake as well. 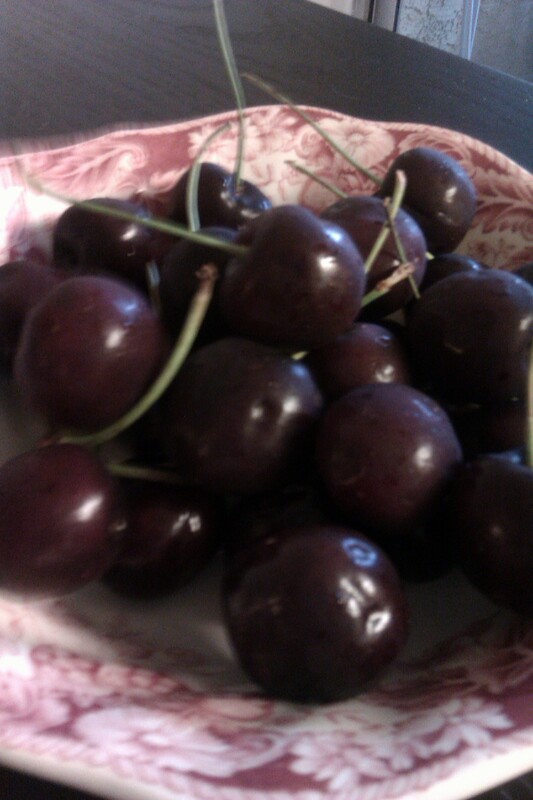 I was excited to find fresh cherries in my Bountiful Basket this week! 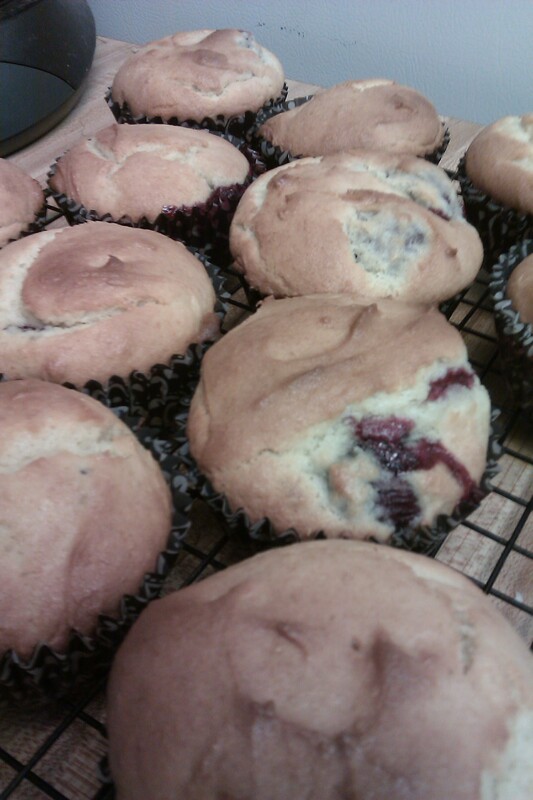 First, because my mom had sent me a recipe for Cherry Almond Muffins. Second, because cherries are anti-inflammatory and there are some studies that suggest that eating cherries can help relieve arthritis symptoms. I haven’t talked about it yet… But, one of the reasons I haven’t been updating this blog much is due to some health issues. In February of this year things went downhill fast. I hadn’t been feeling great for some time before that. But… I wrote it off as stress. Too much work. Too little sleep. A lot of personal stuff going on… You know. Life. But, in February, my body started screaming at me that this was something more than just a bit of stress. All of the joints on the left side of my body started aching. The fingers on my left hand were twisted painfully and refused to relax. My hip and knee (left leg only) would occasionally give out and refuse to support me. I had a couple of falls and found it difficult to walk. Sometimes I found it difficult to even get out of bed. Yeah. My body was screaming for attention. So far, I’ve seen several primary care docs, 2 neurologists, a rheumatologist, a GI doc, an OB/Gyn, a podiatrist, and an eye doctor. I’ve been diagnosed with advanced osteoarthritis in my spine and a case of iritis. I’ve been through a bunch of tests… ruling out several possible issues… but mostly just leaving more questions than answers. So, instead of relying on help from doctors, I’m focusing on nutrition and seeing a Rolfer. I’ve had more improvement from this course of action than in four months of seeking help from doctors. I started looking around the internet searching for inspiration to use cherries in a savory application. 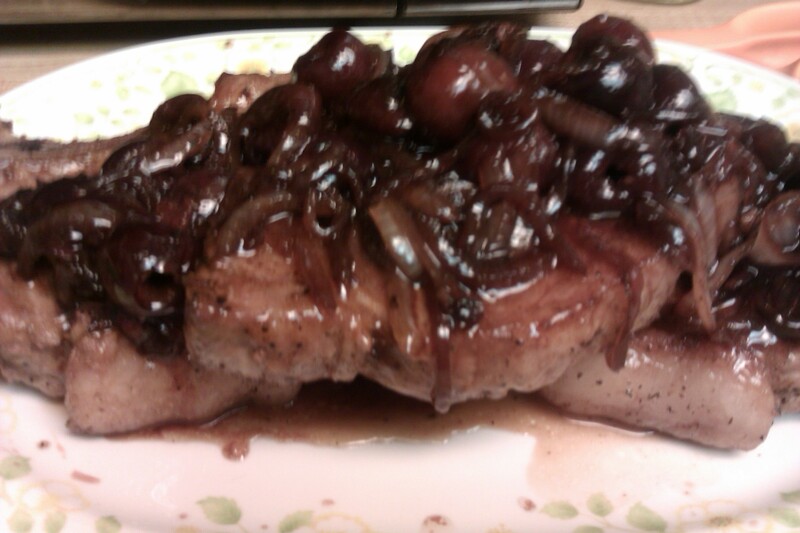 I was extremely excited to find this recipe for Cherry Glazed Pork Chops. First of all, it was already naturally gluten-free. Second, it just looked really good. I only made some minor changes based on just what I had on hand. I had some beautiful bone-in pork loin chops fr0m the Meat Shop so I used those instead of boneless. I used marsala instead of port. I used yellow onions instead of shallots. I used red wine vinegar rather than balsamic. And… it was very, very good. I would like to try the recipe as written in the future, though… just to compare. And because cherries and pork are insanely good. Since I already had the cherry pitter out… I went ahead and pitted extra cherries so I could make my mom’s Cherry Almond Muffins. 385 grams Better Batter flour – remove about 1/3 C and add to the cherries. Toss to coat the cherries. Set the cherries aside. Then, add in the dry ingredients. I did this in about 3 additions, just to keep flour from flying all over my kitchen. Gently fold in the cherries that have been tossed in 1/3 C flour. Line a muffin pan with muffin cups and fill about 2/3 C full with batter. Bake at 400 degrees for 18-20 minutes. You can cool these on a wire rack and then enjoy warm – fresh out of the oven… or wrap and refrigerate or freeze. Gently warm the muffins before serving. Jump ahead twelve years from the last Cooking Through the Decades project to 1917. I really don’t know much about 1917 except that it was the year the United States entered World War I. Apparently Chicken a la King had been around for some time in the year 1917. The great people at America’s Test Kitchen spruced up the recipe for today’s cooks. And, because it’s what I do, I’ll make their recipe gluten-free. Since they suggest serving this creamy chicken concoction over toasted supermarket Italian bread, my first step in making this dish gluten-free was to bake up a loaf of bread. You could also serve this over mashed potatoes, rice, or noodles. For a low-carb version, I would make up some cauli-rice or faux-tatoes… perhaps even serve with toasted almond bread. The recipe itself only contains 3 Tablespoons of flour, so this makes it pretty easy to make into a gluten-free or low-carb dish. In order to stick to the recipe as closely as possible, I decided to save de-carbing the dish for another time. 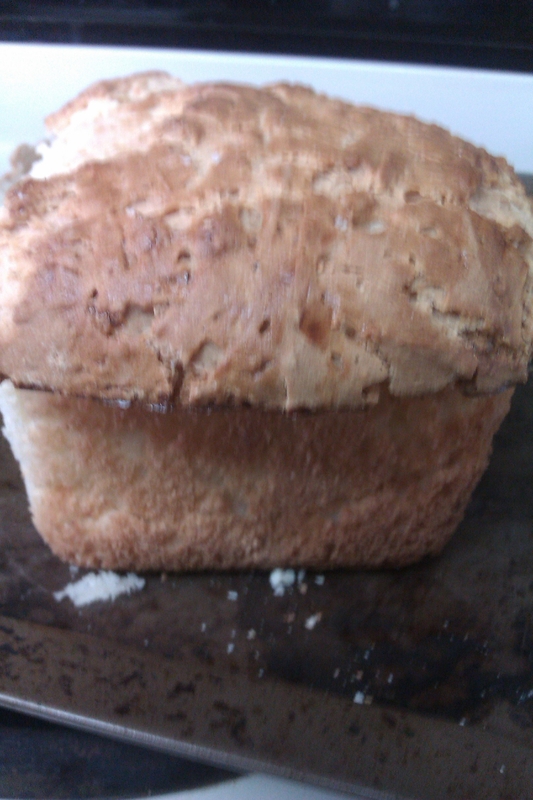 I had to watch over this bread closely as it cooled… Both of my kids were eyeing it like they hadn’t eaten in weeks! It didn’t help that the whole house smelled like fresh-baked bread. Need a gluten-free bread recipe? Try this one or this one. Back to Chicken a la King – As a first step, the chicken is marinated in heavy cream, lemon juice, and salt for 30 minutes in the refrigerator. Prepping the veggies is next. Dice an onion, thinly slice mushrooms and red bell peppers. Bring oil to temperature in a large skillet and then cook the onion until golden. Add the red bell and mushrooms, some salt and pepper, and cook until the veggies have softened. Then, Madeira (or in my case Marsala) wine goes in the pan, followed by chicken stock and heavy cream. The sauce is allowed to thicken before adding the marinated chicken (along with its cream marinade). Once the chicken is cooked through, add some lemon juice and parsley and serve with toast. Both kids liked this a lot. (And, so did I.) So, another successful Cooking Through The Decades recipe is completed. I wonder what the 1920’s will bring! 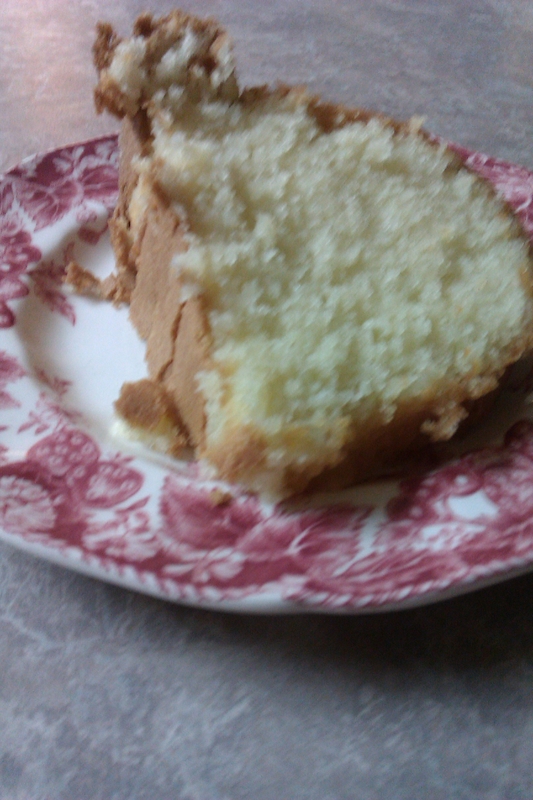 The first recipe is from 1905 and it’s called Cold Oven Pound Cake. The recipe appeared in Cook’s Country February/March 2008. My first step was to convert their recipe to Gluten-Free. It was easy enough as the main ingredient to worry about was flour. Thanks to Better Batter, that doesn’t even phase me anymore. I use 120 grams of the Better Batter flour for every cup called for in a regular recipe (unless of course the recipe writers are nice enough to give a weight measure in the first place). So far so good. The recipe calls for a 16-Cup Tube Pan. Since it was 10:00 on a Sunday night and I didn’t already own a Tube-Pan, I decided to use my Bundt Pan. If I like the recipe enough maybe I’ll go buy a Tube Pan… but then again, if I like the recipe enough, maybe I’ll just keep making it the way I did this time. It’s too soon to tell. The pan is in the oven right now. Whisk together the 340 grams of Better Batter flour (or flour of your choice), 1/2 tsp baking powder, and 1 tsp salt. Set aside. Measure 1 Cup Whole Milk in a Liquid Measure Cup and add 2 tsp vanilla (make sure gluten-free!) Set aside. In my stand mixer, I combined 20 T of softened unsalted butter with 2 1/2 Cups of sugar and turned the mixer to medium until I had a nice fluffy mixture. Then I added 6 eggs, one at a time, letting them work their way into the mixture before adding the next one. Sadly… on the fourth egg, I accidentally dropped part of the egg shell. Don’t worry… I think I got most of the eggshell out of the batter. And, well… you don’t have to eat it, do you? Yes. I could have started over with 20 more Tablespoons of softened butter and another 2 1/2 Cups of Sugar, but I didn’t. It was already late, and I didn’t want to wait for the butter to soften again. After digging out the partial egg shell, I reduced the mixer speed to low and added the flour in 3 additions, alternating with the milk mixture (beginning and ending with the flour). Then I prepared my Bundt Pan by greasing with shortening and giving a light dusting of about a Tablespoon of Better Batter. I poured the mixture into the prepared pan and placed it in the oven. This is the neat trick about this recipe. You don’t pre-heat the oven. You put the cake in the oven and THEN turn the oven to 325 degrees. The directions state to bake until golden brown… about 65 to 80 minutes! Once I got the cake in the oven, I sat down to write out this post. That way, I would be ready to take a picture, add it, try the cake, and post! The rest of the directions tell me that I need to let this cake rest in the pan for 15 minutes and then cool for 2 hours. Honestly. I’m going to be asleep in 2 hours. So, I will finish up this post in the morning and let you know how it turned out. At the moment, the cake appears to have a beautiful crust and the toothpick came out clean when inserted… More to come in the morning! Well, it’s morning. I can now tell you about the Cold Oven Pound Cake. This is a very moist, buttery cake. The best part to me is the crisp exterior promised in the recipe. I’m really looking forward to finding out this week’s Cooking Through The Decades recipe! Toss all ingredients together and refrigerate until ready to serve. 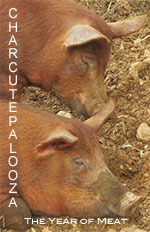 If you haven’t heard about Charcutepalooza yet, head over to Mrs. Wheelbarrow’s site for all the info, including a list of meat-loving bloggers, the Ruhls, the challenges, and much more. The third Charcutepalooza challenge is all about brining. According to Ruhlman, in Charcuterie, “…if you like to cook, you will certainly want to have the brining technique (and a basic brine ratio) in your repertoire.” Well, I like to cook, so I guess this is my month to add the brining technique to my list of things I can do… For the salt solution challenge, which will be posted on March 15th, I am doing this post as a running journal of my brining experience. When I got my order, I was surprised how big 1 1/2″ thich pork chops were. I’d never seen anything like that in a grocery store. They were beautiful. Suddenly, I couldn’t wait to brine these babies! Last night’s dinner was amazing. 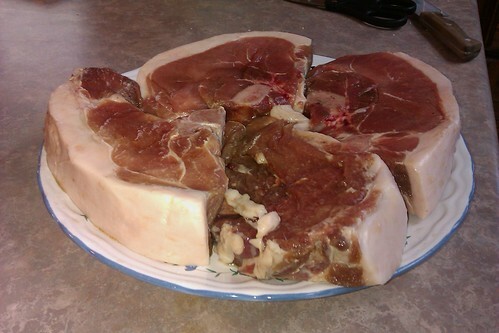 The brined pork chops from the recipe in Charcuterie were very good. Both boys ate with gusto. On the side, I made a simple salad of just lettuce and a homemade mustard dressing and a baked bean dish that rocked. I think the older sous chef had six servings of that. I sliced the onion and put it in the bottom of my baking dish and then covered the onions with the cooked beans. In a bowl, I combined molasses, tomato puree, mustard, vinegar, and salt to taste. 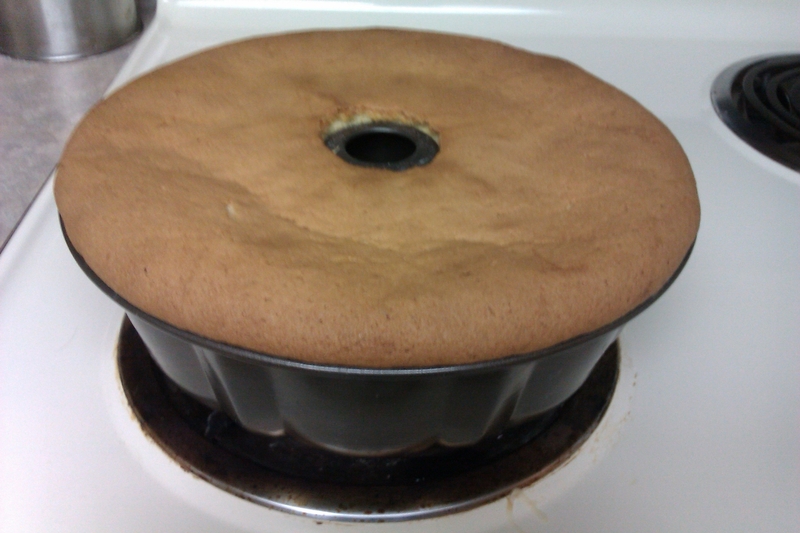 I’m not entirely sure of my measurements… Just til it looked right and tasted good! Olive Oil – I used Queen Creek Olive Oil – go local! For my dressing, I started with a basic oil and vinegar mixture. To this, I added mustard, honey, and garlic. Not really sure of the proportions or measurements here… Again, I go by what looks right. Then, I add the mayo. If I want a vinaigrette consistency, I usually use just a Tablespoon of mayo. This time, I wanted a slightly thicker dressing, so I added mayo… you guessed it… until it looked right. Then, I added salt to taste. The older sous chef ate several helpings of salad, and even told me, without prompting, mind you, how good the dressing was. All in all, the meal was very satisfying, tasty, and plentiful. There’s still some pork chop and baked beans left. Thinking about having some for breakfast! I pulled the corned beef out of the brine solution, rinsed it, and prepared to cook… A bit more pickling spice plus some garlic went in the pot with my beautifully corned beef. Now, how to serve this? Since I’m going to a corned beef dinner soon (complete with cabbage, potatoes, and carrots), I opted to make sandwiches. A stop by Gluten Free Creations for some of their mock rye bread was all I needed. A smear of mustard and layers of refrigerated corned beef on bread that tasted surprisingly how I remember rye bread tasting back when I ate gluten, made one incredible sandwich. Okay. I had two. My little one and I ate big chunks of corned beef for dinner tonight while cuddling together. At four years old, he surprises me with how much he can eat when he likes something. I can safely say that this corned beef has his stamp of approval… He ate all of his and then started picking at my plate. Sadly, the home-brined sauerkraut did not make it… Little spots of mold around the top made me decide it was safer to pitch that experience. The weather has probably been much too nice and I doubt that the temperature stayed cool enough… Perhaps next winter. I mean, it’s technically still winter, but in Phoenix, winter just doesn’t mean the same thing as it does in other parts of the country. I had an awesome time this month with the Salt Solution Challenge for Charcutepalooza. Adding brining to my cooking skills has been a lot of fun. Wanna play along… Mrs. Wheelbarrow has all the details on the April Challenge… Looks like a smokin’ good time! Something tells me there may just be a home-smoked Easter ham in my future… I’ll let you know about my adventures with the Hot Smoking Challenge on April 15. Pork Chops… And technical frustrations. IMAG0580 a photo by pmsister on Flickr. Pork Chops, brined and resting… Ready for dinner.